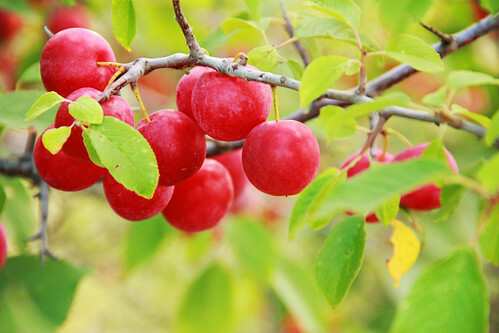 As simple as a plum. 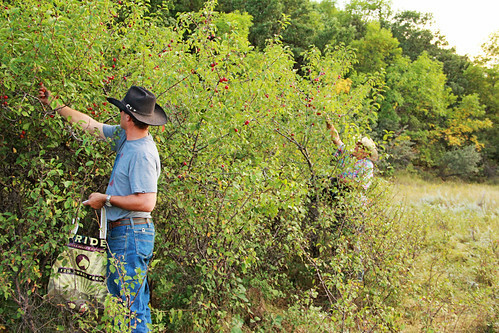 Western North Dakota grows wild plums. In the patches of brush where the poison ivy sneaks and the cows go to get away from the flies, they start as blossoms on the thorny branches and, under the hot sun, turn from green in early July to red to a dark purple bite-sized berry just waiting to be picked in the beginning of autumn. 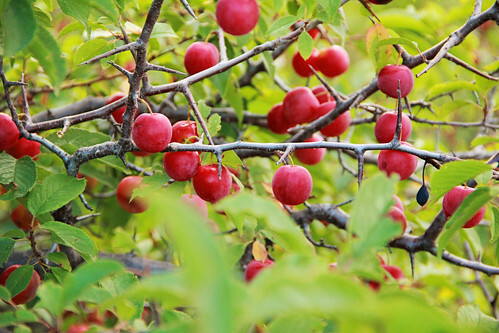 Wild plums mean summer is almost over. They mean roundup is on its way. They mean sucking on pits and spitting them at your little sister. They mean scratches from branches on a detour for a snack on the way to get the bull out of the trees. They mean Pops’ stories of grampa sitting at the table in the winter dipping into a jar of canned wild plums , drenching them in cream and stacking the pits neatly on the table. They mean memories of grandma’s jelly on peanut butter toast. They mean reassurance that sweet things can grow in brutal places. They mean a passing surprize on our way through a pasture and coming back later with the farm pickup to fill up a bucket, me squished in the middle seat between my husband and my dad, the Twins playing on the radio as we bump along on prairie trails that haven’t been under a tire in months looking for that magical patch of fruit, wondering out loud if we could of dreamed it. 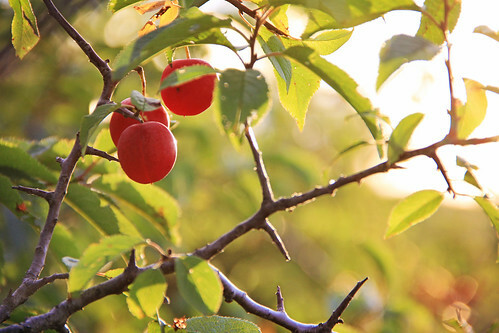 Wild plums mean listening to the two men banter as they pick and reach and gather like little boys, making plans for the best way to fill our bucket. Yes. I could. 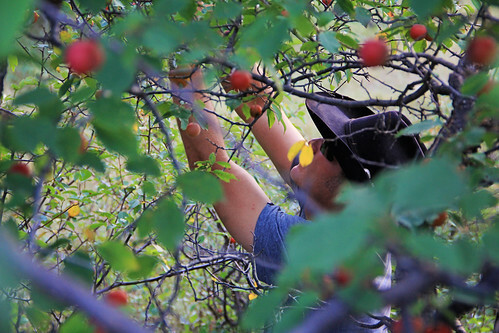 With the 6 gallons of plums we picked last night standing in the bed of the pickup, ducked down in the clearing where the cows lay, scaling along the edges of the trees, I could make jars of jelly, pies, pastries and syrups to last until next plum picking season. But even if I didn’t. 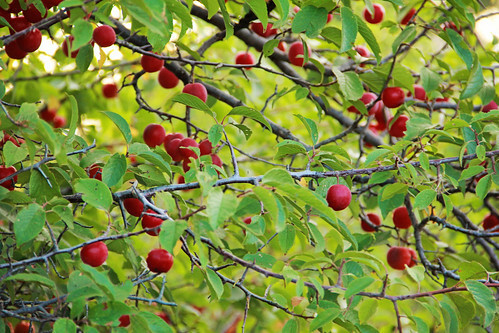 Even if we did nothing more than feed those wild plums to the birds, it wouldn’t matter. 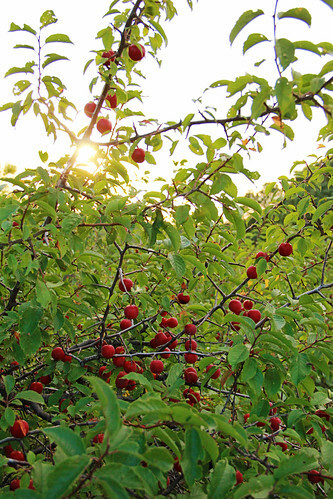 The magic of wild and pure things is in their discovery and the sweet reminder that happiness can be as simple as a wild plum patch. 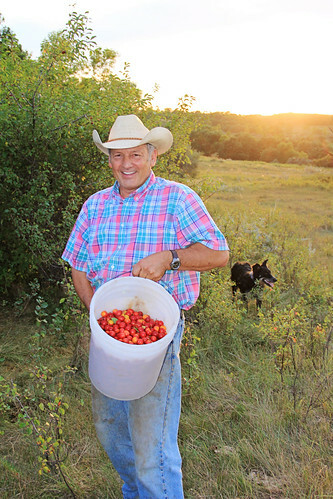 This entry was posted in Ranch Life and tagged family, happiness, Home, life, Nature, outdoors, photography, ranch life, Veeder Ranch, wild plums, writing by Meanwhile, back at the ranch.... Bookmark the permalink. Reblogged this on My Blog paul. 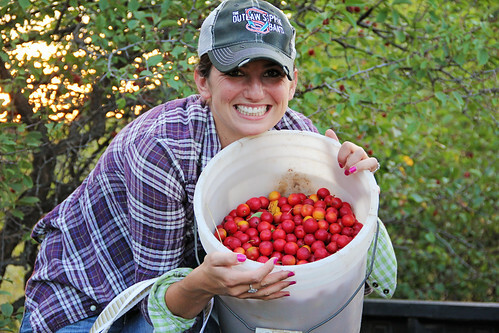 OMG any left.. my wild plum tree died.. and wild plum is my favorite jelly of all time!! think I may have to go plum hunting tomorrow!! You paint a very beautiful picture with this post, thanks. WOW! that is a plumb plum patch!! Reblogged this on Parax: Paper Made of Stone.